The Honeymoon Suite at Sunset Serenade is fully renovated as of May 2018. 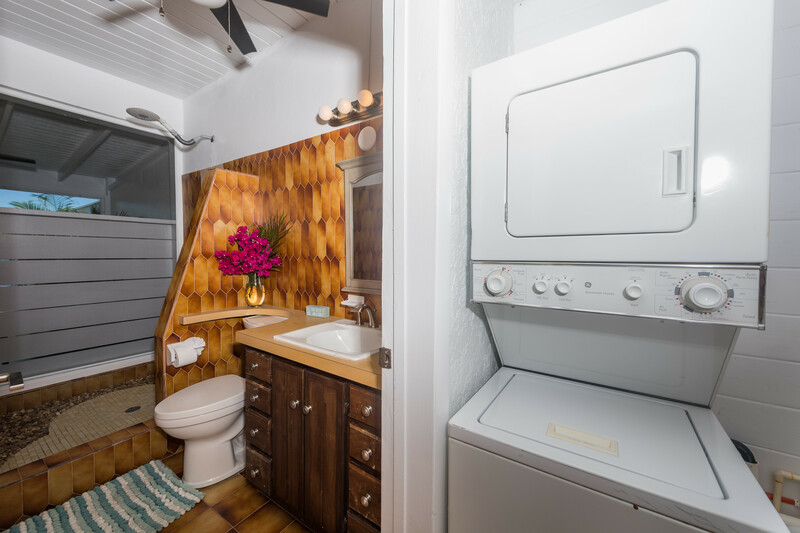 It comes equipped with a comfortable King size bed, air conditioning in the bedroom area, a complete kitchenette, a washer and dryer, and a large shower with a remarkable view that will make you feel like you’re outside. The Honeymoon Suite’s best features, however, are its outdoor living areas. 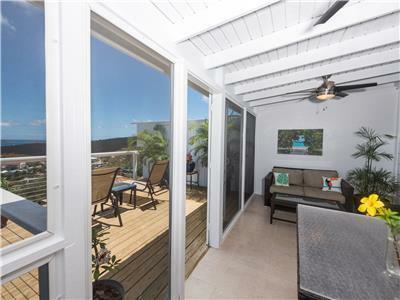 The screened in porch that includes a dining table and sitting area is a great place to relax and feel the trade winds without having to put on bug spray. 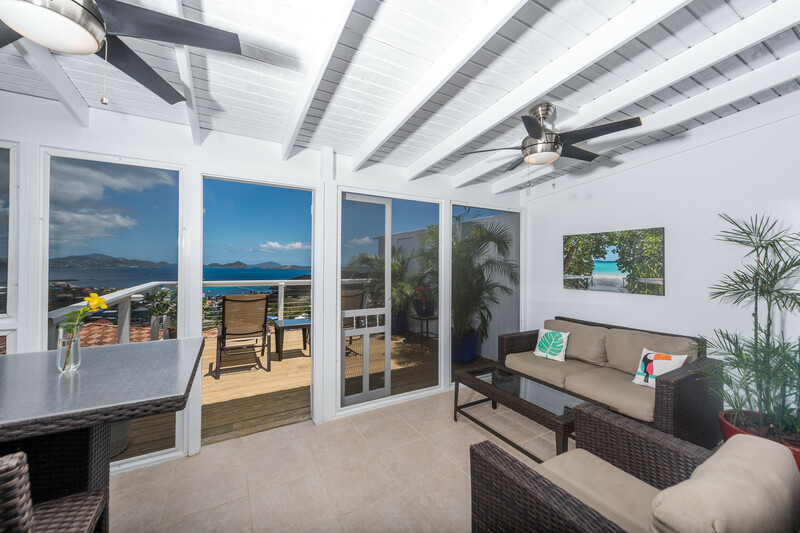 The suite also includes a large deck which has panoramic daytime and sunset views overlooking St. John, St. Thomas and the surrounding cays. When staying with us, you will have everything you need for an unforgettable vacation right at your fingertips. This includes coffee for your mornings, beach towels, beach chairs and a cooler for daytime fun, and comfortable outdoor furniture for you to lounge on while watching the sun dip down into the Caribbean Sea. Whether you’re on your Honeymoon or just want to feel like you are, the Honeymoon Suite will have you booking your next vacation before you even leave … And we promise you won’t ever want to actually leave! 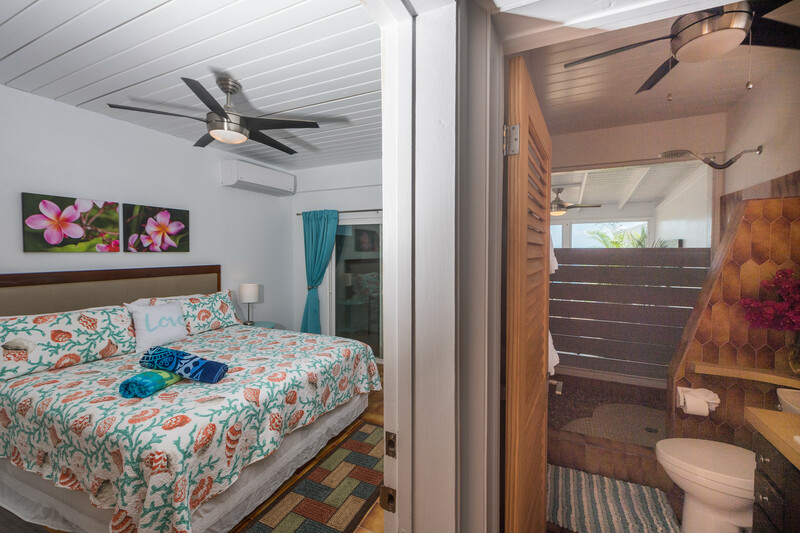 Come see St. John while enjoying the comforts of home at the Honeymoon Suite at Sunset Serenade … we promise you’ll love it! Island Abodes goes above and beyond with their guests! We stayed in the Honeymoon suite and were immediately taken with the view from the balcony. Pictures do not do the view of Cruz Bay justice. It is the perfect spot to watch the sunset! Brittany and Robert have thought of everything. They even included beach chairs, towels, and a cooler for us to use for our beach adventures! I would highly recommend staying with Island Abodes and plan to stay with them again when we return! Wonderful views great place to stay close to town. Just a wow! Thank you. Brittany and Robert’s place was amazing- we got Upgraded to the Honeymoon suite and it was perfect for a few days on the island. The porch and views were amazing, and the place was equipped with everything for the perfect beach day. Will definitely stay again! We had the pleasure of staying at both the Down Yonder Pool villa and the Honeymoon Suite during our visit. The Down Yonder Pool villa is perfectly equipped with necessities for cooking a meal, down to the the luxury of having beach chairs, sunscreen and bug spray. It was also nice having Keurig coffee pods provided for coffee every morning. The villa was spotless and Brittany responded within 15 minutes every time I had a question about anything on island. The Honeymoon Suite is budget friendly and chic! We loved the screened in porch and the sunset at both places were to die for. We had the luxury of getting to spend some time with Brittany, Robert and RJ at a birthday party at the Penthouse and that unit had just been completely renovated and it was absolutely stunning down to the furnishings and all. Their family is so sweet and all their friends made us feel welcome at a party that was just for their friends/family but they choose to include us since we were staying right next door! Thank you and Merry Christmas! We just left St. John after staying in the Honeymoon Suite at Island Abodes. The Honeymoon suite was compact but perfect for just the two of us. 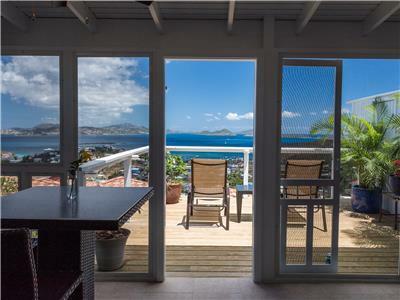 The screened porch and attached deck provided an excellent view of Cruz Bay and a perfect place to watch the sunset. The efficiency kitchen (small refrigerator, toaster oven and microwave) allowed us to eat breakfast before heading to the beach. We ate on the deck one evening after ordering take out from Sam & Jack's. The room was clean and clearly had been updated since the storms. There was some construction noise but that is common throughout the island and by evening was gone. Self check-in/out was easy and Brittany even allowed us to check in early since no one was in the suite before us. We will definitely consider booking again. The view here is amazing! Stayed here Feb 12-17th. The view here is amazing! Started each morning with coffee on the deck watching the island come to life. We stayed in the honeymoon suite and it had everything we wanted and needed. The bed was so comfy! We have been to St John many times and we would definitely stay here again. I couldn’t get enough of the view! my wife and I just got back from our 4 night stay at the Honeymoon Suite, we loved the place and appreciated all of the communication and help. The suite was spotless and nicely setup for all your needs, coffee, beach chairs, cooler, sunblock etc. We really enjoyed sitting the the screened in porch area where the view is just as good as every other spot in the suite, it was our favorite part of the suite ! Having stayed on St. John for the 3rd time now and having friends & family stay at other villas we can appreciate all of the items you guys provide along with the tips & guidance. Many places do not go out of their way like you do to help get you setup for an enjoyable time, while getting to St. John is a little work... your help made it that much easier and allowed us to enjoy it more. The location is great, a parking spot is key, clean sheets, extra towels, washer/dryer, beach towels... and the view is just fantastic. We will certainly have Island Abodes on our list of places to look at when coming back and will give your info to our friends & family for their visits. We had a wonderful stay at The Honeymoon suite for 4 days. It was very nice and clean and had all the things we needed. It had perfect view on the balcony to watch Sunset every night and also could sit in screened in porch with sofa and chair. It also had a perfect view of Cruz Bay and you could see St Thomas lights at night. The landscape around the property was beautiful and well kept. The location was very close to town and easy to get into town and all the beaches. The main room was just right with king bed and also had everything you need with small kitchen area and TV and desk. The bathroom was very unique also with half screened in shower with nice decorations. We enjoyed visiting with Brittany and RJ on our last night and look forward to staying there again. My husband and I spent 5 amazing days at Honeymoon Suites. Everything was even better than described and pictured. The suite was private, clean and perfect for the two of us. We loved the location and the view was just stunning. All the amenities that are provided make packing and planning much easier. We loved having the towels, chairs and coolers to pack for a beach day. Brittany was quick to respond to any questions that I had before and during our stay. The self check in was super easy and convenient. We would not hesitant to stay here again and can’t wait to return. This property was exactly what they said it was and delivered in all aspects. The location and view was perfect. Good value for the money. It contained all the comforts of home including air conditioning in the bedroom/kitchenette area. The landscape really helped to relay a tropical feel. Can't wait to see it in 10 years. It was hard to find at first but after you get used to it and the skinny, steep and twisting roads of St. John it wasn't really an issue. You'll want to rent a 4wd for rainy conditions and because there is really nothing to walk to easily or safely. Wonderful place to relax with beautiful views and convenient location. 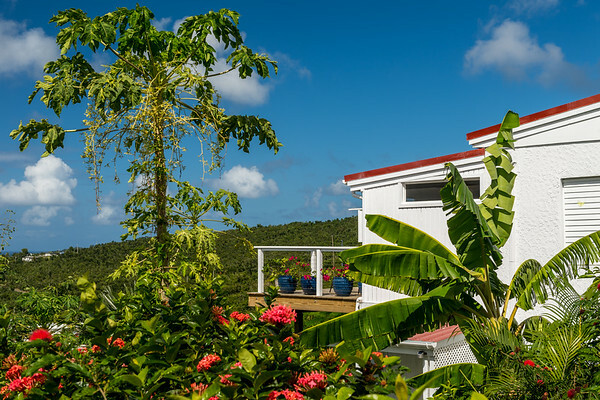 Brittany and Robert’s place is the perfect place to get away for a relaxing visit to St. John. My mom and I stayed here for a quick mother daughter trip and loved it. Our favorite part was relaxing with a cup of coffee on the screened in porch or balcony. The place has an absolutely beautiful view at sunset. It’s less than a 10 minute drive from Cruz Bay with many great restaurant options, and was around a 15 minute drive to all the beautiful beaches we got the chance to explore. Brittany and Robert thought of just about everything we could need and provided sunscreen, beachchairs, towels, coffee, snacks, etc. I definitely recommend renting a car if you stay here. We tried to make the walk from the suite to Cruz Bay just for fun one night, and the hills defeated us by the end of the trek. This was definitely a great, relaxing, affordable option! Island Abodes is the most amazing place! My dearest friend and I were back again to the honeymoon suite post hurricane Irma. Robert and Brittany and baby RJ all in sight and loving. This family is amazing. This place is amazing. They provide everything from first day arrival to expert advice on day activities. I love they provide beach items: chairs, coolers, towels, bug spray, and cool floaties. They also are connected and will help you arrange for very cool excursions with others who care about your visit. We dove, snorkeled and took a day trip to BVI. This is a kid glove service with love! Once you go you’ll be back. Brittany, Robert and RJ we’ll see you soon. Best, Chris and Kellie. My husband and I were already on St. John when we saw that Island Abodes was having a great Facebook sale. We were ready to try a new part of the island and so we took advantage of the opportunity to stay at the Island Abodes Honeymoon Suite. I can say with confidence that this was the best unplanned decision we've made on a vacation! The suite is perfect itself, but it's the views that are breathtaking. The screened in porch is awesome because if it rains or if there are biting critters about, you can still enjoy the view and be protected while you lounge on the patio. The suite is close to Cruz Bay and the Starfish Market (which I just shopped at for the first time in three trips and loved it!) Yet, it's also quiet and private. Brittany is very nice and responsive to emails and calls and you can tell she and Robert run a first class operation. It was a wonderful place to find ourselves unexpectedly on this most recent trip to St. John. I am now even more excited to be staying at one of the other Island Abodes properties on my trip back this fall with my girlfriends. This was my first visit to St. John. The honeymoon suite was awesome. I had a view of the water and beautiful gardens...even from the shower! I couldn't believe when I walked in, there was a welcome note from Brittany and Robert along with coffee for the Keurig, sunscreen, mosquito spray, umbrellas, a cooler, chairs, and towels for the beach and a gallon of water to get started. The king bed was so comfy. A nice kitchen with everything you could need including a microwave and toaster oven. You could sit outside on the screened porch or lounge on the beautiful deck. Thank you for an awesome first trip to St. John! Our first two nights we stayed in the Honeymoon Suite. We were amazed how quaint, cozy, and accommodating the suite was. It fit our needs by including a washer/dryer that came in handy. The view was spectacular as we sat on the balcony drinking coffee! We used the kitchenette for our breakfast and enjoyed eating out at the restaurants that were open like the new restaurant Lucky Chops! Thank you Robert and Brittany for an incredible stay! We stayed in the Honeymoon suite which was very clean, very cool when we wanted it to be, and had the most incredible view of the sun set. Right over Cruz Bay! Brittany and Robert were beyond accommodating and we can not wait to come back and stay in the Honeymoon suite again! The Honeymoon Suite was absolutely incredible! My stay during June 2018 was wonderful! I'm a frequent Island Abodes guest and the new outdoor living areas are awesome! I LOVE the new screened in porch with a seating area and table. I also enjoyed soaking up some sun on the outdoor deck and watching the gorgeous sunsets with a glass of wine. The shower view is just as amazing as I remember! Robert and Brittany have done some amazing renovations to this suite and I can't say enough good things about it. St. John was great post storm. All of my favorite restaurants, Cruz Bay Landing, Longboard, Hightide, Sun Dog Cafe, and so many more were all open and the food was fantastic! We even went to a new restaurant in Cruz Bay, Lucky Chops, which was so yummy! Breathtaking beaches, awesome food, fantastic suite, everything was so wonderful! Thank you Island Abodes for another fantastic vacation! Thank you, Shelby, for the great review of the Honeymoon Suite! We love the new renovations too! We are hard at work to get Island Abodes back and better than it was before the hurricane. It sounds like you made full use of the screened in porch and deck! We feel like our frequent guest are part of our family! Thank you for choosing us again. We hope to see you back in Love City very soon! 5 Stars – What a great location for a great price! 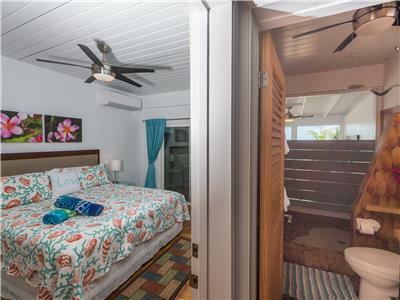 My wife and I stayed at Island Abodes' Honeymoon Suite last August and again just last week. 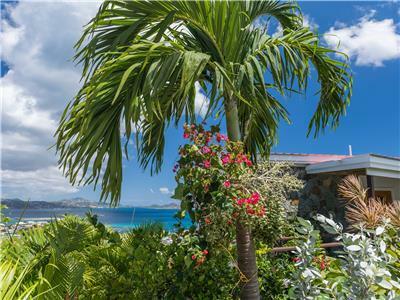 The location is incredible with stunning views overlooking Cruz Bay, especially at sunset. The personal touches Robert and Brittany add to their properties make all the difference, not to mention they are wonderful people and so easy to deal with. If you are looking for location, convenience and coziness at an economical price, then one of their suites will be sure to please. We will be staying again with Island Abodes. Thank you Bobby and Lisa for taking the time to write a review of our Honeymoon suite. We are happy to hear that you enjoyed your stay with us again. I love that you appreciated all of our personal touches, the location, and the price of this unit! At Island Abodes, we always want to give our guest the best experience possible, and we are glad that we succeeded. Thanks again; we hope to see you back in Love City very soon! Awesome place, great view, I would recommend this place to anyone. Thank you so much for your review Brian. We are so glad you liked the Honeymoon Suite and enjoyed the view. It is a pretty great spot to wake up and end the day while on vacation! We appreciate your willingness to recommend the Honeymoon Suite guests. 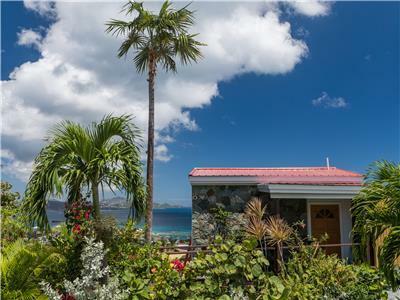 We hope to share our properties with many St. John visitors to come. Our stay in the Honeymoon Suite was great! What a view from the deck!! We had an excellent view of the July 4th fireworks over Cruz Bay, not to mention sunsets and moon gazing. The king bed was quite comfortable, the love seat on the deck was cozy, and the accommodations were superb overall. Thanks so much! Hi Jeana and Chuck! Thank you so much for the review of your stay in the Honeymoon Suite at Sunset Serenade. We absolutely love the view from the private deck, too! Those fireworks were incredible, so glad you were able to enjoy them from the comfort of your suite. We're happy to hear you found the bed comfortable, the outdoor furniture cozy, and the accommodations superb! 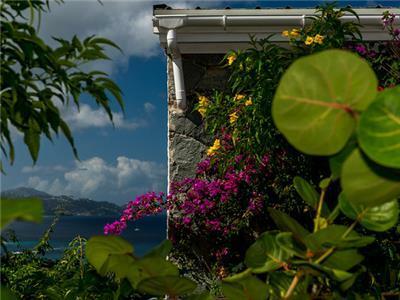 We hope to welcome you back to Island Abodes for your next visit to beautiful St. John. Amazing views, comfortable, private, great communication! The Honeymoon Suite helped to make our escape to St. John perfect. I can honestly say that I have never been to a hotel room/home with a more amazing view. While there are a few other homes on the property, you feel like you are in your own little world while in the Honeymoon Suite. The deck is completely private and makes for a wonderful spot to eat breakfast or have a cocktail at sunset. The room itself is very nice and perfect for a couple. The bed is very comfortable and plenty roomy for two. All of the staff are extremely helpful! I've never had better communication from any resort/hotel I have stayed at. They don't bother you while staying, but they send you recommendations and ideas how to make your trip wonderful. Any question we had was answered within a few minutes of sending an email. Thank you for the lovely review of your stay in the Honeymoon Suite at Sunset Serenade, Eric! I'm so happy to hear how much you enjoyed the beautiful Caribbean views from the spacious outdoor deck, the private feel of the suite, and the comfortable bed. At Island Abodes, we strive to provide our guests with impeccable customer service, and I'm so glad we succeeded! There is no request or recommendation too small. We hope to welcome you back to sunny St. John and Island Abodes again soon! We absolutely loved our stay at the Honeymoon Suite! It was perfect for just the two of us - clean, comfortable, and had an amazing view. 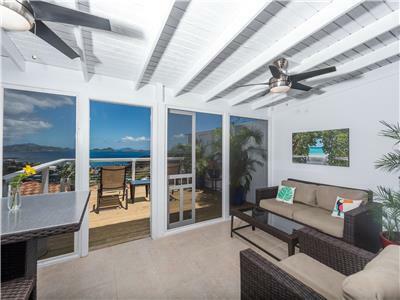 Would highly recommend the Island Abodes properties to anyone staying on St. John! Karah, thank you so much for the review and recommendation of your stay in the Honeymoon Suite at Sunset Serenade! I'm thrilled to hear how much you enjoyed the accommodations. Robert and I strive to maintain clean, comfortable, and relaxing suites so I'm happy this was your experience. 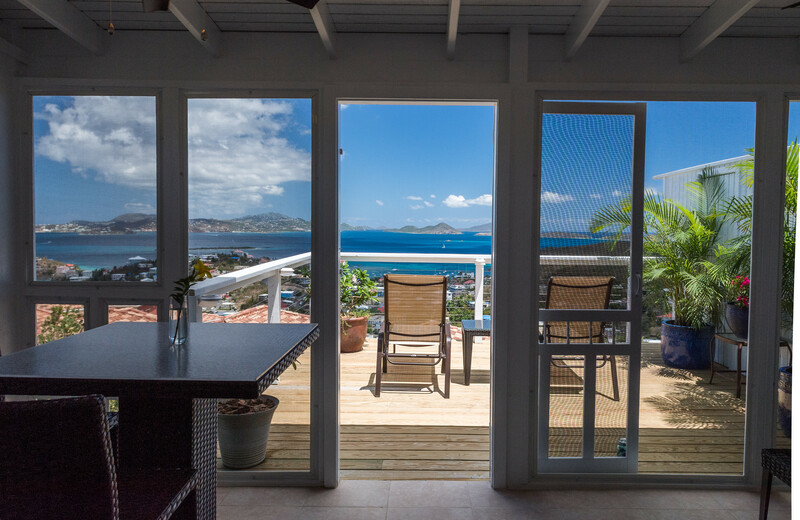 We love that beautiful Caribbean view from the private deck, too! Come visit us at Island Abodes again soon! The honeymoon suite was so lovely, and we had an incredible time in St. John! The view from the private balcony is gorgeous. The king size bed was extremely comfortable. Brittany provided us with everything we could need, and gave us wonderful recommendations so we could make the very most of our trip. She always responded quickly with thoughtful and helpful advice. Thank you so much for a great stay! Thank you Jackie! We were so pleased to hear that you enjoyed your stay in the Honeymoon Suite, especially with the spacious balcony and comfortable King size bed. We appreciate you taking the time to post a review on Airbnb and for your kind words regarding your stay. Thank you for choosing Island Abodes and please join us for another stay in the future! 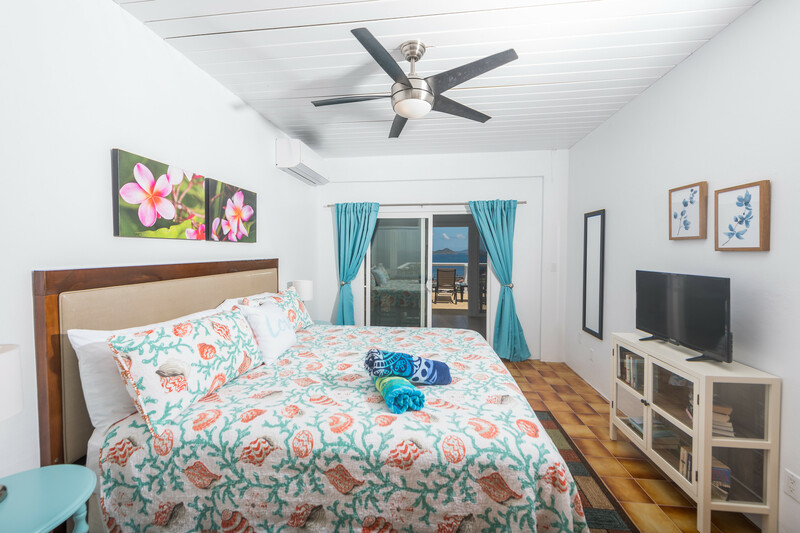 A comfortable bed; a deck with a spectacular view of Cruz Bay. Carl, I'm so glad you had a pleasant stay with Island Abodes! We hope you come back to enjoy the Caribbean views again soon. The honeymoon suite has an amazing view over Cruz Bay. It was so easy to get around and was the perfect accommodation for us. Brittany and Robert were so helpful with directions and suggestions throughout the trip! The little kitchenette was great for a quick breakfast in the morning and we bought salads and sandwiches at the grocery store for the week. There's so much to do on the island we could've easily stayed another week! We absolutely would stay here again. Amazing views, a charming, comfortable and very clean accommodation, and great hospitality - what more could you possibly ask for! Hi Emily! Thank you so much for the lovely review of your stay in the Honeymoon Suite at Sunset Serenade. Robert and I are happy to hear you found the accommodations clean and comfortable and that you were able to enjoy the sweeping Caribbean views from the private deck; it is certainly one of the best features of the suite! We are always glad to help our guests in any way we can by providing recommendations and island tips to make your vacation as relaxing and convenient as possible. Please come see us in Love City again soon! We just returned from a long wedding weekend in St. John and consider ourselves lucky for finding the Honeymoon Suite at Sunset Serenade! We met both Brittany and Robert, the owners and managers, who were so kind and helpful. They have taken diligent care of the property, and Robert was there several times on the property tending to the landscaping. The photos don't do the place justice! The views from the deck were some of the best we found on the island and we found ourselves rushing to get back to our room by 6:15 for the sunset. I think the deck may be actually larger than the bedroom, a ratio which may be most important in deciding on a place to stay in the islands :) The place was spotless, the bed incredibly comfortable, and we had everything we needed and then some. Thank you Brittany and Robert, and we cannot WAIT to return again someday! Julie, thank you so much for the lovely review of your stay in the Honeymoon Suite at Sunset Serenade! Robert and I so enjoyed meeting you both and we are happy to hear how much you enjoyed the comforts of the suite. I love that you took advantage of the spacious private deck to soak up those beautiful Caribbean sunsets each night! It is certainly a breathtaking sight. Robert and I can’t wait to welcome you back to Island Abodes for your next visit to St. John! Quaint, clean, convenient location with a great view and fairly priced. What else do you need? Bryan, so happy to hear you enjoyed your stay in the Honeymoon Suite at Sunset Serenade! Thank you for taking the time to write a review. We hope to welcome you back to Island Abodes for your next Caribbean vacation! Appreciate the beach amenities ( beach towels, cooler, noodles, beach roll up mat), including Sunblock and Aloe Vera! We found out how beneficial the Aloe Vera was. Bathroom was stock with shampoo and body soap which saved us going into town to buy some. The place was quiet and felt secluded even though we had neighbors, which was exactly what we wanted. The only thing the room lacked was T.V. but we realized we didn't need one since we were out most of the day and can use Wi-Fi on our mobiles to watch shows if needed. Definitely would recommend to other travelers. Hello Chang! Thank you for the review and recommendation of your stay in the Honeymoon Suite at Sunset Serenade. I'm so happy to hear that you enjoyed the variety of beach amenities provided; we certainly know how important these essentials are on a Caribbean vacation! It sounds as though the private, quiet location of the suite was a perfect fit for you. 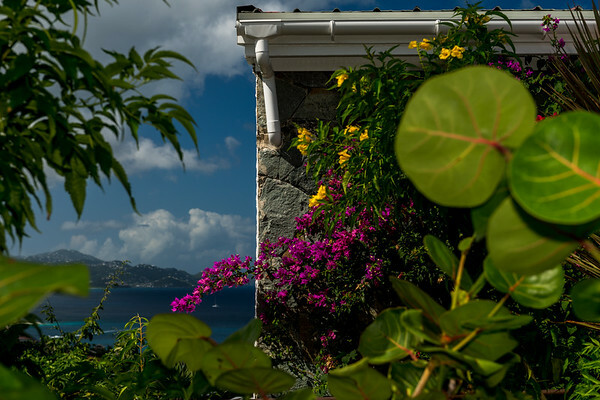 We hope to welcome you back to Island Abodes and beautiful St. John again soon! We just returned from a wonderful, long wedding weekend in St. John and consider ourselves lucky for finding the Honeymoon Suite at Sunset Serenade! We met both Brittany and Robert, the owners and managers, who were so kind and helpful. They have taken diligent care of the property, and Robert was there several times on the property tending to the gorgeous landscaping. The photos don't do the place justice! The views from the deck were some of the best we found on the island and we found ourselves rushing to get back to the room by 6:15 for the sunset. I think the deck may be actually larger than the bedroom, a ration which may be most important for finding a place to stay in the islands :) The place was spotless, the bed incredibly comfortable, and we had everything we needed and then some. Thank you Brittany and Robert, and we cannot WAIT to return again someday! Each time it is amazing! Our second stay with Island Abodes and of course it was great to see Robert & Brittany again! Brittany picked us up from the ferry dock which was great since we didn't have a jeep rental until the day after our arrival. Brittany actually helped me book our jeep rental since I had trouble finding availability. Both Brittany & Robert go far above and beyond for their guests. The Honeymoon Suite was of course perfect. The perfect amount of space, and the view is breathtaking!!! It's conveniently located near Cruz Bay so super easy to get to all the restaurants! We also booked our snorkel gear through Beach Bum and got 10% off since we stayed with Island Abodes (great perk)! 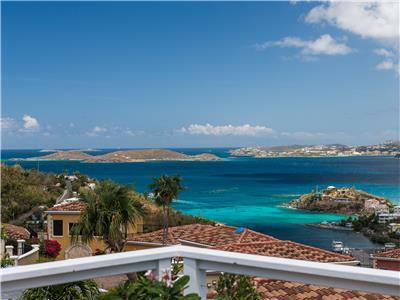 We will continue to stay at Island Abodes for all of our future trips to St. John. Peggy, Robert and I are thrilled to have earned your loyalty to Island Abodes! As small business owners, our goal is to cater to our guests and provide impeccable customer service. It makes me so happy to know we have achieved this. I love hearing how much you enjoyed your stay in the Honeymoon Suite at Sunset Serenade; we absolutely can't get enough of the gorgeous Caribbean views, either! 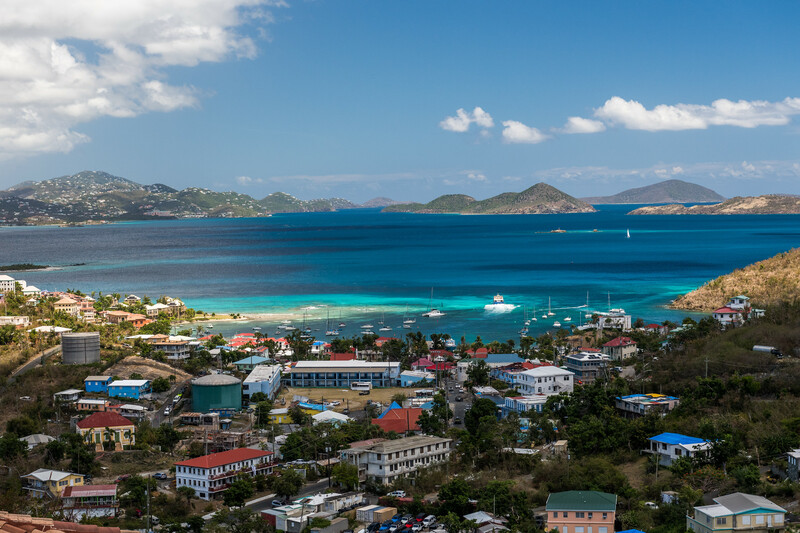 Come back and visit us on sunny St. John again soon! We rented the Honeymoon suite for 7 days and it was so perfect! Only about 5-7 minutes to town using a jeep which we highly reccomend ! Brittany was very warm and welcoming which made our stay even better! This was our 4th trip to St John and our first trip just the two of us. If you are a single traveler or a couple this is a perfect location! The bright room was very well air conditioned, the deck was even bigger than it looks in pictures and the round lounge chair was very comfy for evening drinks on the deck! Jennifer, thank you so much for the lovely review of your stay in the Honeymoon Suite at Sunset Serenade! I’m happy to hear that you found the location convenient and the accommodations comfortable. It sounds as though you enjoyed relaxing on the private deck! 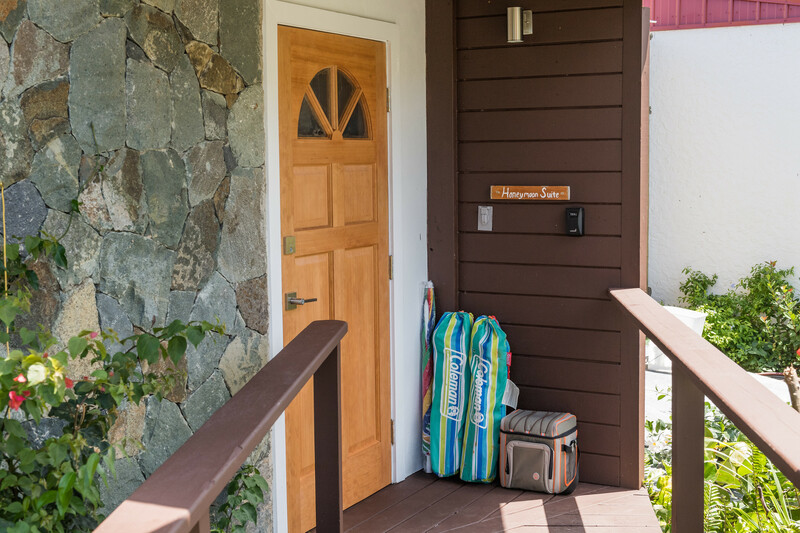 We hope to welcome you back to Island Abodes for your next St. John vacation. My girlfriend and I visited St. John for the first time over this past new year. From the day we made our reservation with Island Abodes to the day we left, Brittany was an incredible help. She gave us great recommendations and advice on places to eat, rent cars, sailing, and snorkel gear. We stayed at the Honeymoon Suite, and it was incredible. The view from the deck was breathtaking. 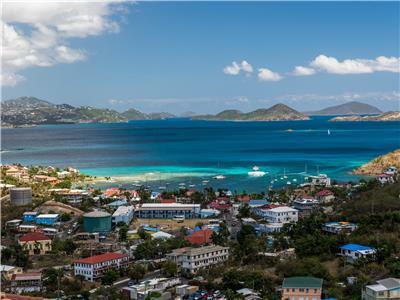 I can't imagine a better view of Cruz Bay exists. The deck is large and has a table as well as plenty of seating to sit back and enjoy a morning cup of coffee or a glass of wine at sunset. Brittany was responsive within the hour for our entire stay if we had any questions. The suite was clean, cozy, relaxing and beautiful. There is a great little area with a BBQ in front. We cooked up a steak one night and utilized the toaster over to cook a few other items. The drive in to town is just a couple of minutes and to get to any of the beaches on the north side of the island is very quick and easy. We were very happy that we ended up a little bit above the town as it is nice to get to a private quiet space when we wanted to. The privacy within the units at Island Abodes is also great. We never heard or saw any of the other tenants while hanging out on our deck. We bumped in to neighbors a couple of times while BBQ'ing or walking to/from our vehicle. But it is otherwise completely private. Many thanks for the stellar review of your stay in the Honeymoon Suite at Sunset Serenade! I’m thrilled you found the location to be convenient and the suite to be clean, comfortable, and well stocked with amenities. 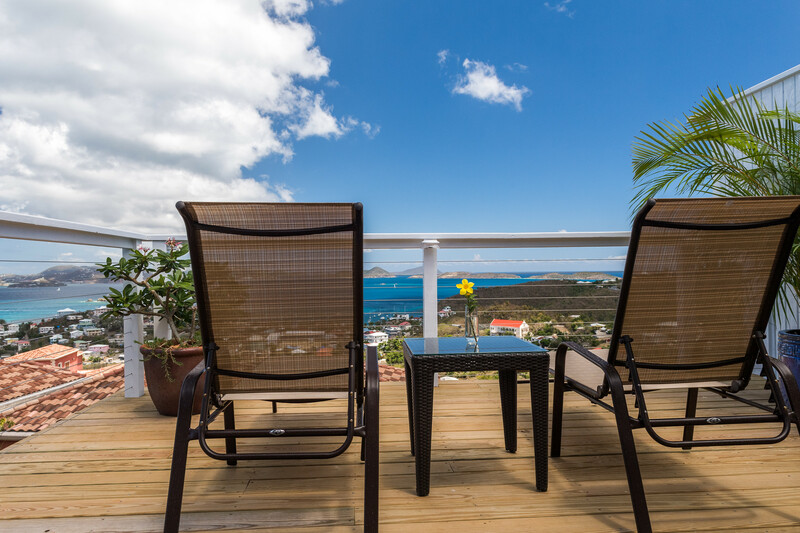 The private deck with stunning Caribbean views is absolutely one of the best features of the suite, so I’m happy to hear you and your girlfriend were able to immerse yourselves in the outdoor living experience that we cherish here in the islands. We know privacy on vacation is much appreciated by our guests, so I’m glad you both enjoyed some peace and quiet! I strive to be accessible to our guests and I love to share recommendations, as St. John offers a wonderful variety of restaurants to visit and countless options for activities. Robert and I hope to welcome you back to Love City for another stay with Island Abodes soon! My husband and I stayed at Island Abodes for 5 nights in November. We were in the Honeymoon Suite, and it was perfect for us! The deck has amazing views, and has a table and chairs, as well as a comfy lounger for two. It was a great spot for a sunset cocktail or morning coffee. The suite is just the bedroom/kitchenette and a bathroom, and although it was smaller than the pictures online made it look, it had everything we needed and it was very comfortable. The shower is incredible! It has a huge screen overlooking the water so you feel like you are outside. The bed was really comfy and it was nice to have a Keurig for coffee in the morning. The location is close to town, but we would recommend renting a Jeep. We did the walk a couple times, but it is a very steep walk. It took us about 20 minutes to get into town on foot, and longer on the way back, as it is uphill the whole way. We ended up taking taxis back and forth for the first couple days, and then rented a Jeep for the remainder of time. Better to rent ahead of time, as we ended up paying more to get one last minute. Brittany was really responsive before and during our trip, and we appreciated that she was just a phone call away if we needed anything. 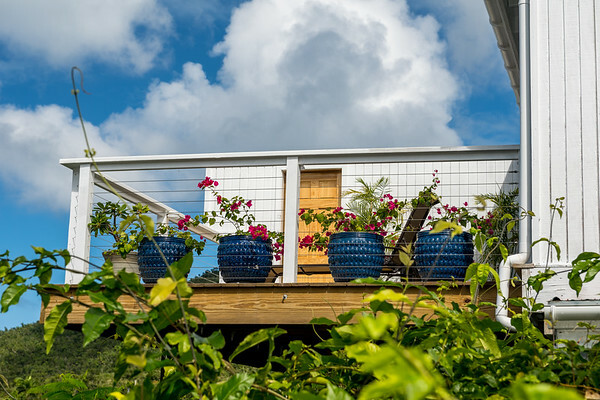 We definitely recommend Island Abodes, and will be back for sure! Kaitlin, thank you so much for your review and recommendation of the Honeymoon Suite at Sunset Serenade. 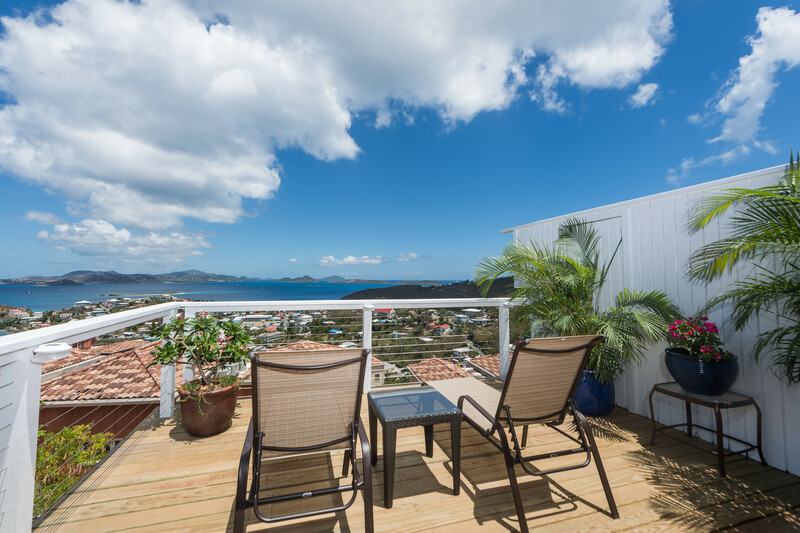 It sounds as though you and your husband loved the beautiful views of St. John from the private deck and that you enjoyed the outdoor living space the suite provides. I’m happy to hear you found the accommodations to be comfortable and that you enjoyed the outdoor feel of the shower … it’s one of our favorite features! We agree that due to the location of the suite, it is most convenient to rent a Jeep or take taxis during your stay because of the steepness of the roads. It can be a quite a workout to walk! Robert and I are always accessible to our guests as we want you to have the most relaxing and fun Caribbean vacation possible. We hope to welcome you back for another stay with Island Abodes in the future! We came here for our 5th year anniversary. This was our first time renting a vacation home. We didn't know what to expect but we could already tell from Brittany timely responses to emails and also with bunch of information to get us navigate our ways through the island. We were very flabbergasted when we got to our room. It was the best view we have ever seen. This was not our first vacation but this was the best with the closest view. We enjoyed our stay and all the amenities provided to make it enjoyable. We saved a lot of money since we were able to prepare our own meal. It also felt like home since Brittany and Robert made this place like an abode. We will sure come back with the kids to stay at the Penthouse. Thank you Brittany and Robert for making our stay a memorable one. Lola & Yemi, I am so happy we were able to help you celebrate your 5th anniversary island style in the Honeymoon Suite at Sunset Serenade! Robert & I are thrilled you took advantage of the spectacular views from the private deck, along with all of the amenities provided to make your stay as comfortable and convenient as can be. 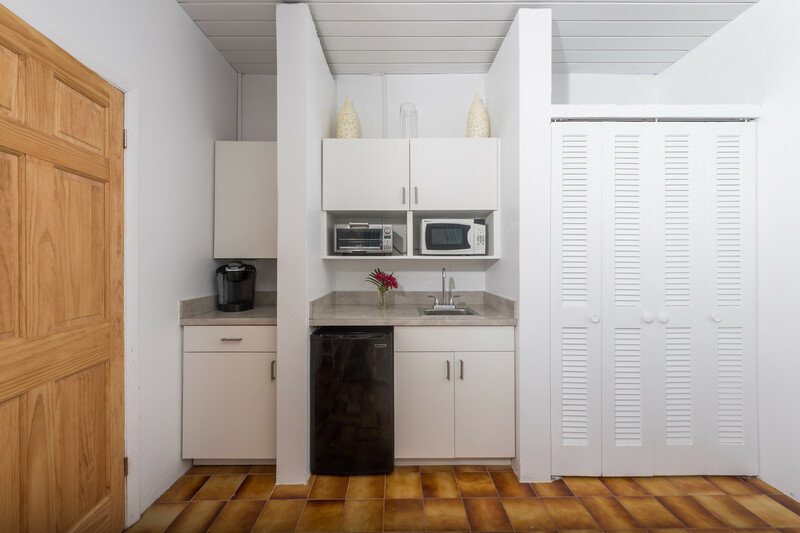 I love to hear that you utilized the complete kitchenette to prepare meals in your suite, making you feel right at home while still enjoying your vacation! We so appreciate you taking the time to leave a review, and we can’t wait to welcome you back with the rest of your family to stay with Island Abodes and once again experience all that St. John has to offer! On a work trip to St. John, they took my reservation without any hassle. The hosts are very informative and assist you every step of the way. The room was very clean and comfortable. I had a private terrace with an amazing view. 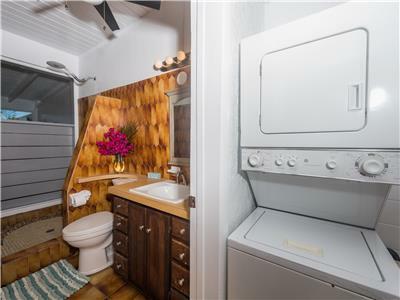 My favorite feature was the bathroom. I had an indoor/outdoor shower that allowed me to soak in the views at every waking moment during the stay. I'd definitely recommend. Thank you for the great recommendation Ian, and for taking the time to share it on VRBO. We’re so glad we were able to assist you with your stay and that you took advantage of the gorgeous views offered from the Honeymoon Suite. The indoor/outdoor feel of the bathroom shower is also one of our favorite features, so we’re happy to hear you enjoyed it! We hope to have you stay with us again soon. Best thing was the view! 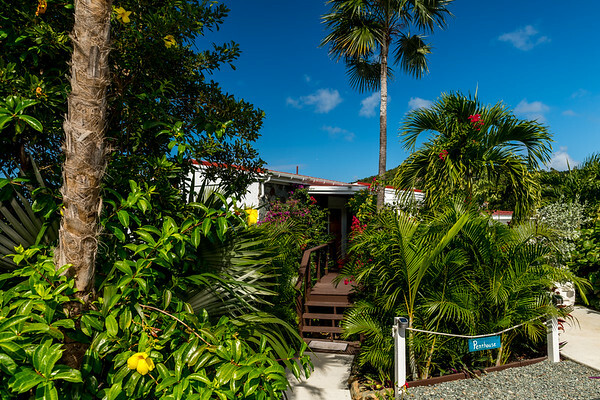 David, thank you so much for taking the time to leave a review of your stay with Island Abodes. To ensure that our guests have the best vacation possible, I strive to be thorough and informative! I’m happy to hear that the information provided was helpful to you during your trip to St. John. Robert and I hope to welcome you back to Island Abodes soon! We came here for our 5th year anniversary. This was our first time renting a vacation home. We didn't know what to expect but we could already tell from Brittany timely responses to emails and also with bunch of information to get us navigate our ways through the island. We were very flabbergasted when we got to our room. It was the best view we have ever seen. This was not our first vacation but this was the best with the closest view. We enjoyed our stay and all the amenities provided to make it enjoyable. We saved a lot of money since we were able to prepare our own meal. It also felt like home since Brittany and Robert made this place like an abode. We will sure come back with the kids to stay at the Penthouse. Thank you Brittany and Robert for making our stay a memorable one. Lola and Yemi D.
Unbelievable stay at the Sunset Serenade on St John, U.S.V.I. The absolute best sunset view at any place I have ever stayed in my life. The view was spectacular of Cruz Bay, the ocean, boats in the harbor, other Islands and the sunset. We went to an Island to experience Island life and that is exactly what we got. Our room was perfect and our hosts went the extra mile to help us decide how to maximize our activities on St John and other islands. Thanks to Brittany, we did more activities, had more fun and spent less money than we had planned on. I would recommend Sunset Serenade Suites to anyone wants to experience the Island life in the Caribbean. Wow Omar, thank you so much for your great review! I can't thank you enough for sharing your feedback and kind words on VRBO. Robert and I truly enjoyed having you and were just so happy to hear how much you enjoyed your stay with us. It was my pleasure to provide you with suggestions and recommendations. We want all of our guests to enjoy our beautiful little island to the fullest! Thank you again and please come back to stay with us in the future. 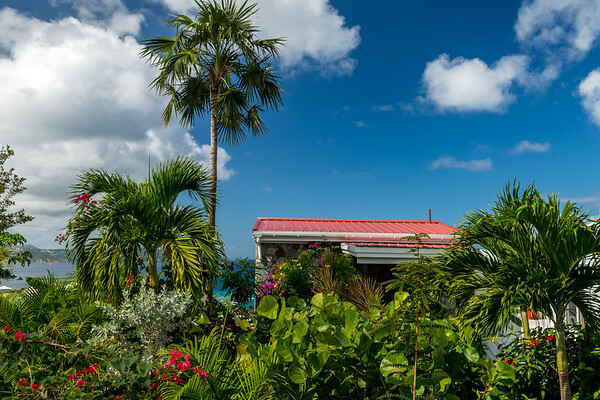 We'd love to provide you with another stay at Island Abodes that exceeds your expectations! Take care! My husband and I just return from our 6th trip to St. John! We stayed in the Honeymoon Suite at Sunset Serenade, our first time at this property but 5th stay with Island Abodes! The view was AMAZING! We drank coffee on our private deck each morning watching the boats and ferries come in and out of the bay. The sunset views were breathtaking! Maybe the best on island. The unit has super cold AC which we only ran at night. The king bed was incredibly comfortable too - I slept better there than in my own bed! It was just up a hill from the town of Cruz Bay, so it was incredibly convenient too! Everything was perfect! We will be back soon! PS - we were welcomed with two cold local beers and snacks! Very thoughtful! Thank you for your review and for taking the time to post it on VRBO! Robert and I love to read our guest's feedback so thank you for your feedback regarding your stay at the Honeymoon Suite. 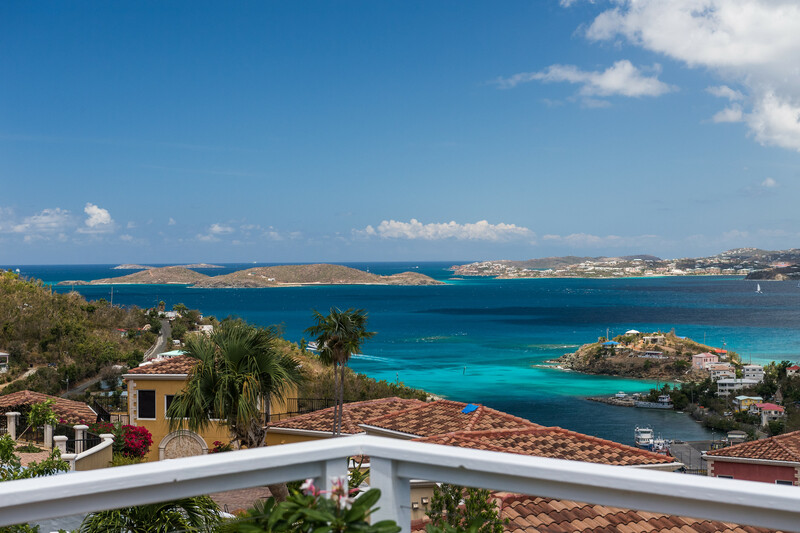 As frequent visitors to St. John, we know you have a choice when it comes to a place to stay, so we're glad you chose Island Abodes. It was nice to hear that you slept well, enjoyed the private deck and stunning views, and found the location convenient and easy to access. We're glad you enjoyed the beers and hope to welcome you back in the future. Thanks again! We loved our stay in the honeymoon suite! The sunscreen, shampoo, body wash, and coffee provided was very useful! We used the cooler, beach chairs, and noodles at many of the beaches. We visited many of the national park beaches and participated in the hikes! The hikes were a challenge but the views from the top are worth it! The room was very comfortable. Air conditioning in the bedroom kept us cool and the view from the deck was amazing! The view can also be seen from the shower! Robert and Brittant were so nice and made sure our trip ran smoothly. We will recommend Island Abodes to friends and family. We also will hopefully be returning to STJ very soon! We hope you'll be returning to St. John very soon too Emily! Thank you so much for taking the time to post a review regarding your recent stay at Island Abodes. It sounds as though you enjoyed the Honeymoon Suite and the island as a whole. We're so glad you were able to enjoy the National Park, go on beautiful hikes and take in the breathtaking views. We always recommend our guests get out as much as possible and enjoy the island, so Robert and I loved reading that you did just that. Thanks again for your review and recommendation. Please come back soon! Island abodes was AMAZING! I can't even begin to say enough wonderful things about our experience. My husband and I stayed in the Honeymoon Suite and it had the most breathtaking view I have ever seen! It was the perfect size and Brittany and Robert had literally thought of everything to help make our vacation as easy and carefree as possible - binoculars, sunscreen, beach chairs, shampoo, coolers, water, etc. while we were there we also got to tour ALL of their other properties and I must say they did NOT disappoint! You can't go wrong! 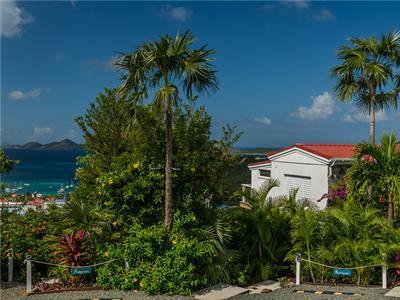 The penthouse and honeymoon have a wonderful view of Cruz bay. The home at chocolate hole has a pool as well as an incredible view! Robert has done an exceptional job landscaping and the flowers and scenery are unbelievable! If you are traveling with a family you could easily rent all properties at sunset serenade and still be together - for example parents could stay in the penthouse and teenagers in the one bedroom or honeymoon. Same if you are traveling with couples and wanted to have your own space but still all be together. There is also a grill in the courtyard if you wanted to do that; however the food on the island was incredible so don't miss out on that! I would highly recommend any and ALL properties for rent. Wonderful experience, wonderful people, wonderful owners, and a wonderful island. We will be back soon! Loved it and loved island abodes! What a great review Cassey, thank you so much! We truly appreciate your kind words and details regarding your stay at the Honeymoon Suite. We're glad you enjoyed the accommodations, the amazing views, and the surrounding tropical gardens. Robert and I can't thank you enough for recommending not only the Honeymoon Suite, but all of our Island Abodes properties! That means so much to us and we hope you'll be back to see us in the future. Thank you again and we'll see you soon! We were very happy to stay at the Honeymoon Suite at Island Abodes. 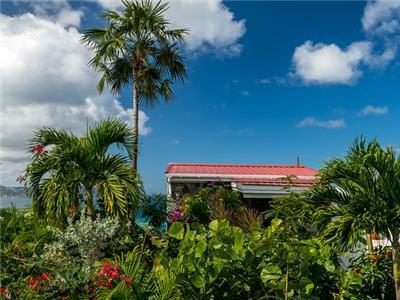 The property sits at the top of a hill overlooking Cruz Bay. You'll need a jeep to get to town. The honeymoon suite is basically a bedroom, a cool indoor/outdoor bathroom, and a large veranda overlooking Cruz Bay. There is a super comfy two-person circular couch on the veranda where we spent time just looking out to sea. There were beach chairs, sun screen, coffee, a fridge, and maps. Overall, it was comfortable and just what we needed. Thanks Julian! We appreciate the details you provided regarding the Honeymoon Suite and its setup. Robert and I were glad to hear you guys were comfortable and happy. Thanks again for sharing your feedback and please come back and stay with us again in the future. We'd love to provide you with another relaxing stay! The Honeymoon sweet is perfect for any couple looking to get away! Quiet, private, comfortable and what a view! The owners have done a really nice job with this property. Everything was updated, clean and well thought out... Good location as well... We'll be back! Thanks so much Bret! Robert and I appreciate your kind words and feedback regarding your recent stay with us at the Honeymoon suite! We're so glad you found the suite comfortable, clean, private and well equipped with updated appliances and amazing views! Thank you again for your review and for choosing Island Abodes. We'd love to welcome you back anytime! Thanks for sharing your feedback on Airbnb Tim! We appreciate you taking the time to post a review regarding your recent stay with Island Abodes. We're glad you were able to explore the island a bit and see the beauty that is St. John and the Virgin Islands National Park! Trunk Bay has been rated one of the top ten beaches in the world, so we're especially glad you ventured out to see that one! Robert and I were so glad to hear that you enjoyed the accommodations and the amenities provided, and we hope you were able to take advantage of not only the grill and microwave, but also the toaster oven, blender, coffee machine and mini fridge! We do our very best to ensure our guests have everything they need for a great stay on our beautiful little island. Thank you for your details regarding the taxi services and rental cars. It will be helpful to future guests! 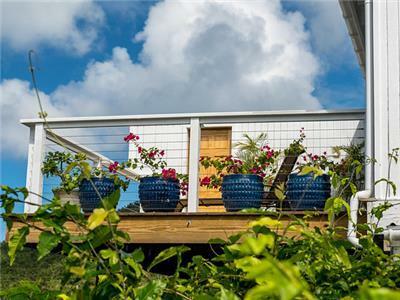 Thanks again for posting such a great review and for choosing Island Abodes! We hope to see you again in the future! My stay in the Honeymoon Suite at Sunset Serenade was wonderful! Brittany and Robert provided beach chairs, a cooler, beach towels, and pool noodles. It was everything I needed to enjoy the beautiful beaches! There was also bug spray, sunscreen, aloe, shampoo, and shower gel in the Suite! There were so many thoughtful touches in the room like ear plugs and fresh flowers. The shower was my favorite part of the Suite. The view from the shower is breathtaking! It felt like an outdoor shower, but with more privacy! I loved that there was a Keurig coffee maker and that there was plenty of coffee, decaf, and tea for me to enjoy. The kitchenette was a perfect place to cook breakfast. The bed was so so comfy. Overall my experience was wonderful and I would recommend staying with Island Abodes to all my friends and family! What a great review Shelby, thank you so much! Robert and I appreciate so many details regarding the Honeymoon Suite and amenities provided for you! The shower is my favorite part of the suite too, so I was happy to hear that you enjoyed it so much. We can't thank you enough for your review and recommendation. 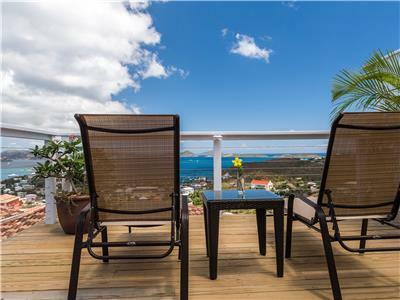 Thanks for choosing Island Abodes and please let us know next time you're coming to St. John. We'd love to host you again and provide you with another great stay! It seriously could not have been better! WOW! Our week in St. John was phenominal! We absolutely loved the Honeymoon Suite- It was everything we needed being on that gorgeous island! Brittany and Robert were so welcoming, and kind. They gave us great information on beaches, and restaurants... You can tell they love what they do, and they love helping others! That back deck gave us MESMERIZING sunset views! I woke up every morning to gorgeous colors in the sky overlooking Cruz Bay! It seriosuly could not have been better! Thank you guys for such an amazing week! Got engaged on the back deck of the Island Abodes Honeymoon Suite! The next morning we took some gorgeous photos of Cruz Bay & my sparkly ring! I am going to miss this view so much!! We had a wonderful stay and cannot wait to come back! Kaitlin, so happy to hear how much you loved the beautiful Caribbean views from the private deck of the Honeymoon Suite! 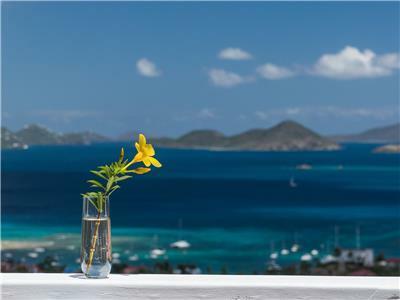 We can't wait to welcome you back to Island Abodes for your next visit to sunny St. John. What an absolutely lovely stay. We arrived in Cruz Bay and got picked up by Brittany who introduced us to St John. We then arrived at our beautiful apartment with an incredible view. Highly recommend staying here. Not a thing to complain about. Thank you for the review of your stay in the Honeymoon Suite at Sunset Serenade, Matthew! We appreciate the recommendation and are so happy to hear how much you enjoyed the accommodations. Come visit us at Island Abodes on sunny St. John again soon! First, Robert & Brittany were gracious, helpful, informative, and welcoming in every way. From the moment we made the reservation, until the day of our departure, we were treated as honored guests. 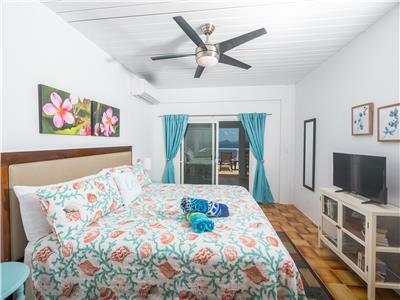 The Honeymoon Suite was pristine, and featured a comfortable, wide deck that offered spectacular views of the hills rolling into town and on to the vivid waters of Cruz Bay. The space itself was comfortable and attractive, and served as the perfect base for our many adventures. As many have noted, the return walk from town is a bit strenuous, but not daunting. For those who prefer, cabs are readily available in town, and can generally be hailed on the fly. This was our first trip to the paradise that is St. John - and we look forward to many more in the future. Our sincere thanks to Brittany & Robert for making our stay so wonderful. Gerald, thank you so much for the lovely review of your stay in the Honeymoon Suite at Sunset Serenade! Robert and I were so happy to host you, and we appreciate the kind words as we strive to offer exceptional service to our guests. I'm glad to hear you found the accommodations to be clean, comfortable, and well appointed. 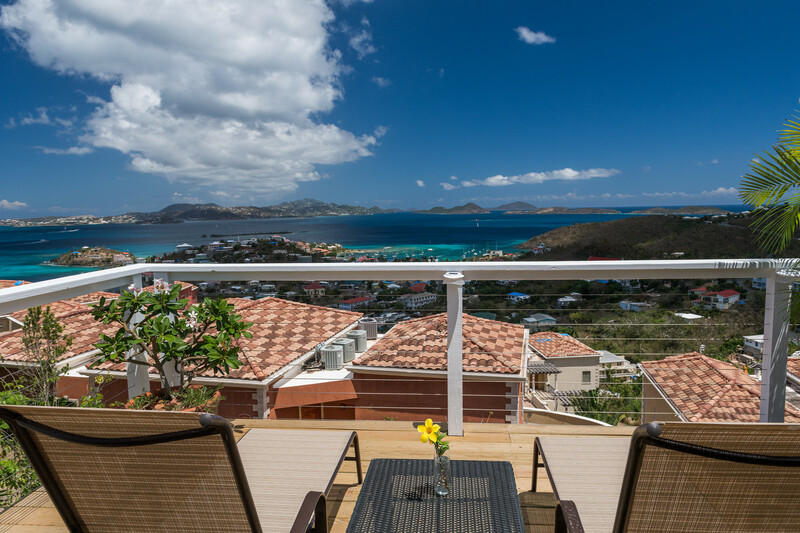 The stunning Caribbean view from the private deck is not one you'll soon forget! Please come visit us in Love City again soon. Brittany went above and beyond to make us feel at home in this wonderful, newly-redone honeymoon suite. A couple of the facilities (e.g. sink in the room) weren't fully installed yet, and future guests will have an even more "complete" experience than we did; I won't say better, because we had a really great time and even extended our stay. The view can't be beat from the ample outdoor patio space, though the drive up to the top of the hill is not for the faint of heart. You definitely need a 4WD SUV in STJ. 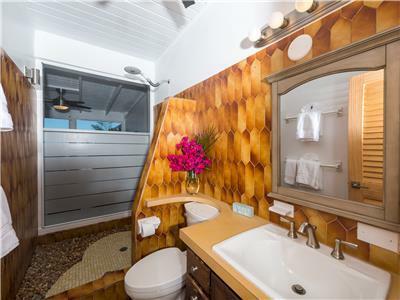 Guests should know that the bathroom (which has also been redone and is really, really nice) has a separate lock (same key) but is connected to the main room through an inner entryway with a sliding door to the outside. Was not an issue for us, and we had would definitely return. Special thanks for providing us the snorkeling gear! We made heavy use of it in the beautiful bays around the island. Marcos, Robert and I can't thank you enough for your glowing review! We always do our best to ensure our guests have everything they need (and then some!) so we were happy to hear you enjoyed your stay and put that snorkel gear to good use! 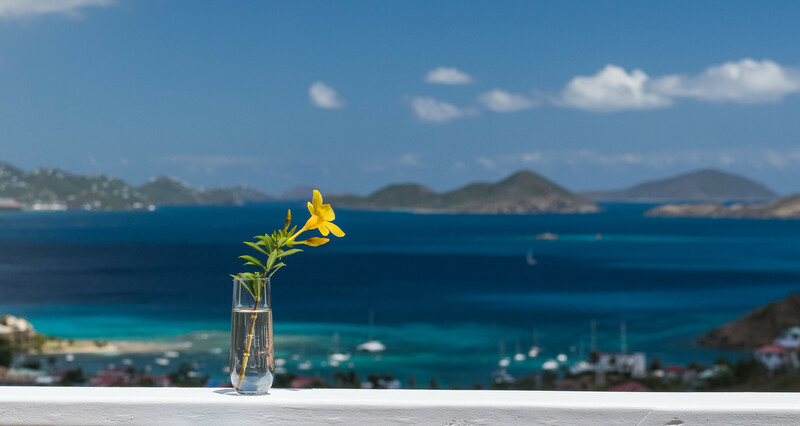 We loved that you were having such a great time that you extended your stay, and we hope next time you're on St. John you'll consider staying with us again. Thanks again for sharing your feedback, hope to see you soon! amenities provided that we hadn't expected! My hosts were great! They met us upon arrival and even offered to meet us at the ferry to show us the way. The accommodations were spotless, and we were able to get in earlier than expected. We told Brittany we were going to be on an earlier ferry and she said "come on up, we'll have your place ready for you soon." We were left totally on our own which we loved! But we also knew if we needed anything our hosts were a phone call away. We loved the view, being able to look over Cruz Bay and the morning activity was fun. Every day we had a beautiful breeze, and there were amenities provided that we hadn't expected, like beach towels, coolers and even an umbrella! It is obvious that Brittany and Robert are working very hard to please their guests. The one thing I would recommend is a set of binoculars - it would be nice to be able to see the boats in the harbor a little more closely. I recommend some kind of lock and key system for them though so they don't go missing even though it's a very safe area and we rarely felt the need to lock up; most nights we slept with the key right in the door :-) Had a blast, many thanks! Thanks so much Jean and Charlie! What a wonderful review and we appreciate your details regarding your recent stay with us at Island Abodes. Robert and I love nothing more than to hear that you had everything you needed, enjoyed your accommodations, and found it to be clean and relaxing. As you mentioned, we do do our very best to ensure our guests are well-equipped and ready for a day on St. John, so thank you for noticing :) The binoculars are a great idea and we truly appreciate the suggestion. Sometimes we are unaware of things our guests may like or need, so we can't thank you enough for sharing that. Thank you again and we hope to see both you and Charlie again in the future! We just returned yesterday from our stay at the honeymoon suite in St. John and we were so sad to leave. Everything was perfect and just what we expected. Brittany and Robert were great hosts and gave us great ideas for our stay. We had a short stay, but we were able to pack in a ton by following their advice. The views from our room were amazing... I liked opening the curtains in the morning and just laying in bed looking out over Cruz bay, slowly waking up. The suite was clean and had everything we needed. His was our first trip to St. John but certainly not our last. We will definitely be staying with them again. We were sad to see you go Natalie! You guys were awesome guests and it was our pleasure to help ensure your first stay on our beautiful little island was just perfect! It sounds as though you guys enjoyed our suggestions and the Honeymoon Suite .. and were able to relax with the great view and clean accommodations. We can't thank you enough for leaving such a great review and we are so excited to welcome you again in the future. Best wishes to you both! By far exceeded our expectations! The hosts, Robert & Brittany, were amazing people, and gave us tons of information about the beaches and restaurants! We felt so welcomed by them! The Honeymoon suite by far exceeded our expectations! It's very clean and comfy... had everything we needed, and the view on the back deck was absolutely breathtaking. We couldn't have asked for more. We loved everything about this suite. The view, the decorations, the space.. it was clean and cozy. Keep doing what you guys are doing, bc it's seriously amazing! Thank you Peggy! What an awesome review... and congratulations again on your engagement! We really appreciate your kind words regarding your stay at the Honeymoon Suite and were so happy to hear you guys had such a great time. It sounds like the view was your favorite part (ours too), so we're glad you were able to enjoy it. We truly hope you enjoyed your time at Island Abodes, your birthday celebration, and your engagement. Thank you again! We'd love to welcome you back anytime, perhaps for your honeymoon :) Take care! beautiful property with a great view of the ocean. Brittany was very helpful and responsive every step of the way. will definitely stay away. Thanks for your review! It was truly our pleasure to have you and to be as helpful as possible. We want you to leave St. John loving it as much as we do, and we hope to see you again for another visit real soon! Thanks again. We had an amazing week at the Honeymoon Suite! Sunning on the deck during the day and star gazing at night. What a great place to disconnect and relax. We appreciate you taking the time to post a review William... thank you so much! It was great having you and nothing makes us happier than to read that you had an amazing week and left feeling refreshed and relaxed. We'd love to welcome you back anytime. Thank you again for your review and for choosing Island Abodes! It will immediately become a favorite of yours! 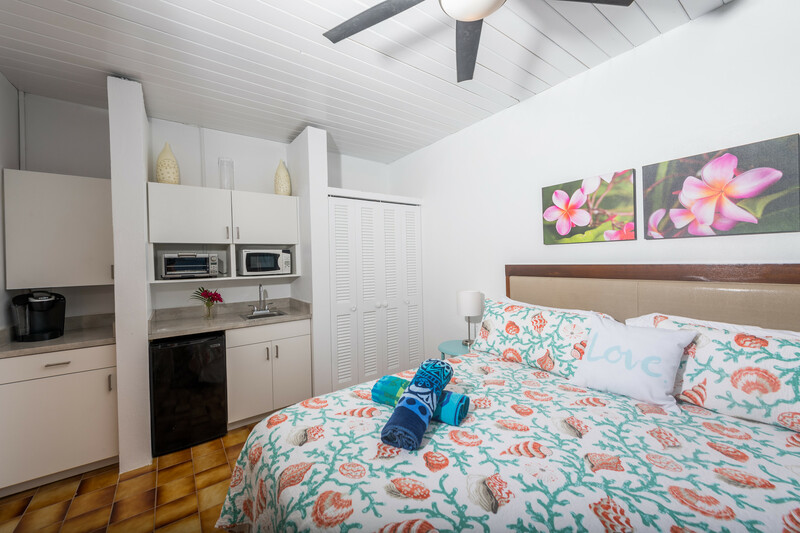 The honeymoon suite is absolutely our favorite place to stay in St. John! Brittany makes us feel SO welcome each time we come. She goes over and beyond to make our stay easy. The location is great, the view is stunning, the honeymoon suite is very private and nothing is missing. We spend most of our time on the spacious private deck with the comfy deck bed where beautifully manicured tropical flowers abound. She provides lovely little touches like bedside flashlights, earplugs, and bugspray but we didn't need any of them. The AC is great! The king bed is SO comfortable and the sheets are luxurious. The blackout curtains are PERFECT for sleeping in late! 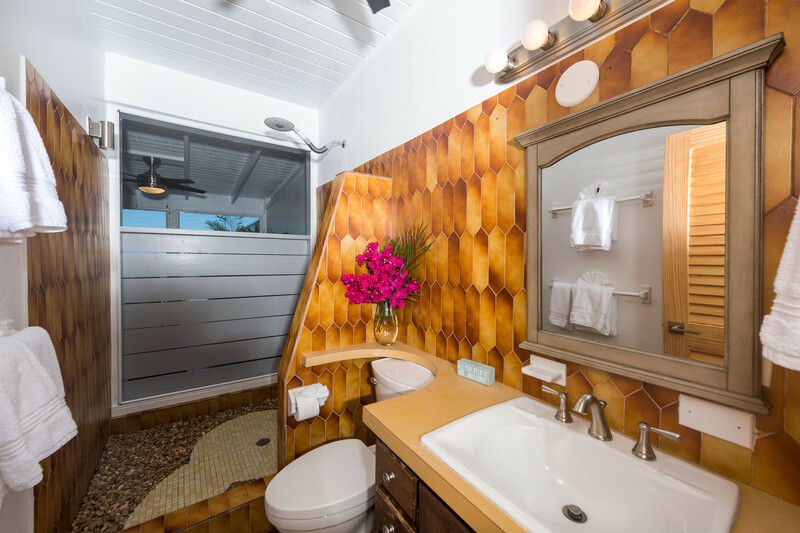 The indoor/outdoor shower is so lovely we want to model our own shower after it! 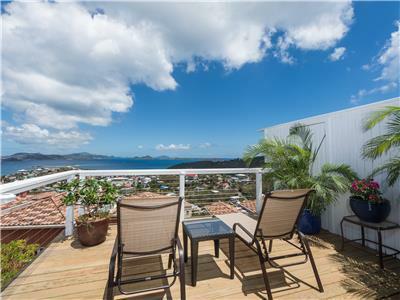 This is luxury at a reasonable price, especially for St. John. I recommend a rental car or taxis as the hill up to the property is steep (although I have walked it with 2 bottles of wine and a gallon of water, so it's doable). A precious little welcome basket brightened our arrival as well as did the perfectly timed 2 welcome beers in the fridge! I cannot get over how beautiful the grounds are: tropical trees and flowers everywhere complete with 2 iguanas rested in treetops nearby. But you can tell how well cared-for all of the plants are - it's not a wild jungle, it's a serene garden! Do yourself a favor and book the honeymoon suite. It will immediately become a favorite of yours! Brittany was overwhelmingly welcoming. From meeting us at the rental car location and taking us to the home, to sending us daily emails with helpful information such as how to navigate the island to when we should get the ferry back to the airport, she was extremely helpful! The house and description was exactly what we saw in Airbnb, the bed was very comfortable, was great to have a mini kitchen, loved having a shower that looked right out to the ocean, just stunning! I would recommend this listing to anyone. I plan to get married next year here, and will absolutely have my family or friends stay here. What an awesome review Larissa, thank you! Robert and I always try and do our best to ensure our guests have anything and everything they could ever need (or want!) so we were happy to hear your stay exceeded your expectations. It was so nice meeting y'all and we look forward to welcoming your friends and family to St. John and Island Abodes next year! We promise to take great care of them for your special day. Thanks again and we'll see you soon! Robert & Brittany were amazing and very helpful! I am a very picky traveler and a stickler for cleanliness and details. I had no problems with my stay. They went above and beyond what I expected. The apartment was perfect and the deck was amazing to wake up to everyday. The apartment was very quiet and peaceful and I had my privacy. I couldnt of asked for a better host who gave me my space to relax and be alone but was right there when I had a question. The downtown area is about a 15-20 minute walk from the house (bring walking shoes typical sandals/flip flops wouldnt be a good idea), bring enough cash for taxi rides (to pull cash from the ATM has a $5 fee) which taxi rides on avg cost were $5 per person to and from the town to the house. Taxi rides from the downtown area to Cinamon Bay or Trunk beach was between $6-$7. Prepare for an major work out if you walk back from the town to the house I would definitely suggest a taxi. Make sure to plan accordingly since calling a taxi to pick you up from the house can be challenging and I usually had to just walk to the town or catch a ride with someone. Locals are very friendly and helpful. There are a few small grocery stores at the bottom of the hill near town that pretty much have everything you may need or forgot but they can be a little pricey. At night once you get outside of the downtown area the streets are completely dark though I always felt safe it was just an observation. Make sure to write down "Sirenusa" (which is a resort literally next to the house) as the point of reference to get back home (since there are no standard addresses on the island) and after a night of partying and drinking its hard to remember the name! My only complaint is I wish I would have booked longer!!!! Thank you so much for the lovely review of your stay in the Honeymoon Suite at Sunset Serenade, Justin! Robert and I are so happy to hear how much you enjoyed your accommodations, and thrilled that it exceeded your expectations. 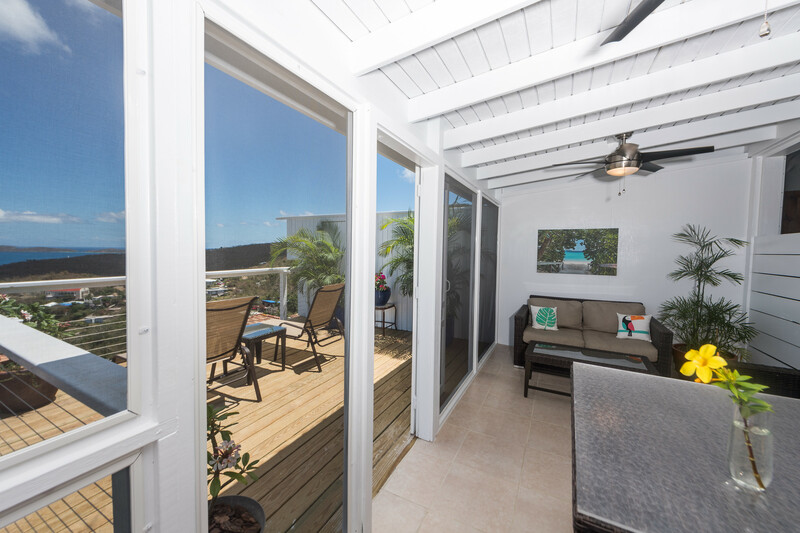 It sounds as though you took advantage of the serenity and peacefulness offered at the suite; the private deck is one of our favorite features, too! You'll have to come visit us at Island Abodes again soon! In every way my expectations were exceeded while staying in Cruz Bay at one of Robert and Brittany's property. The Honeymoon Suite was spacious, very tidy, and centrally located. I started my days with coffee on the quiet and secluded patio where I had a breathtaking view of Cruz Bay and some of the other islands. Other than that you should know that the bed was very comfortable and the above mentioned view was the same from my pillow! They had a great coffee machine, mini fridge, and really cool retro shower with a view of the Bay! Robert and Brittany were very hospitable and informative. They also showed me some of the other properties that were equally lovely. I might switch it up next time I visit and stay in Chocolate Hole. In summary, if your looking for paradise without the crowds this is your St John home away from home! Also, a car is nice however not necessary. Just be prepared to have cash for taxis and or a bit of a workout back home. Thank you for your feedback Suzanne! It is our goal to exceed our guest's expectations and we were just so pleased to hear we did just that during your April stay. It sounds as though you enjoyed the Honeymoon Suite and found it clean, convenient and spacious. 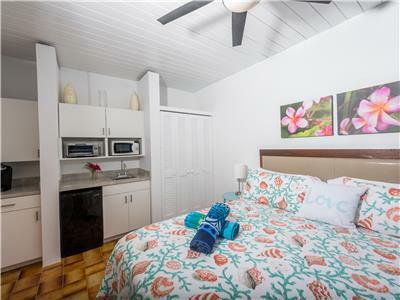 We do hope you'll return to St. John in the near future and as you mentioned, either switch it up and stay in another one of our lovely properties, or just come back to enjoy the Honeymoon Suite once again. We'd love to welcome you and will do everything we can to ensure you have another wonderful stay! Thanks again. This place is definitely the perfect couples' getaway. It was clean, beautifully decorated, and all our needs were taken care of with very little "relaxing space" taken up. The suite has a keurig, microwave, toaster oven, mini fridge and all the essential tableware you'd need to have an extended stay. You can tell Brittany and Robert worked hard to be sure you'd have all the comforts of an extended-stay suite... with a couple island bonuses (they left us bug spray and mini flashlights by the table lamps in case the power went out... which it didn't, but is known to happen on the island from time to time!) The place also has Wi-Fi... How can you argue? 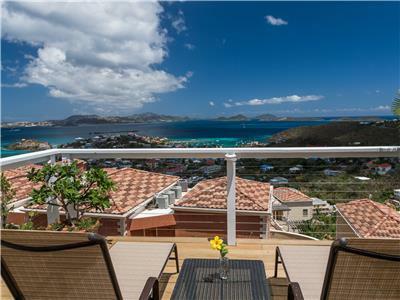 The view is spectacular of Cruz Bay and St. Thomas just a little ways away... there's a big spacious balcony with two sets of lawn chairs (one in the sun and one out). It's about a 25 minute walk downhill into town if you're not in a hurry... and why would you be, on St. John? It is by far the most beautiful and welcoming, tourist-friendly without being touristy-tacky, island in the VI, and I say that as someone who lived on St. Thomas for six months. I can't recommend St. John enough to people who are making the trip here- by all means, visit the other islands, but stay on St. John! As hosts, Brittany and Robert were so welcoming. When we told them we weren't renting a car, Brittany was kind enough to pick us up from the ferry and drive us to their place, showing us where to stop for groceries and the best walking route to take along the way. When we arrived, Robert gave us a quick run-down of everything we needed to know and left us to enjoy the place. We had no issues during our stay and were clear on everything that we needed to know. It was just relaxing, and we wanted for nothing. 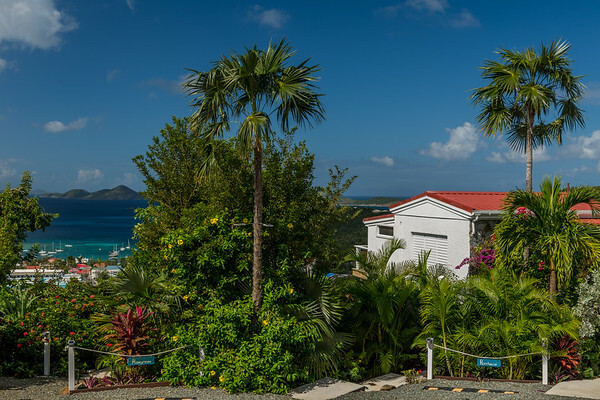 What you should know before you stay: the walk down to Cruz Bay is easy and doesn't take long. The walk back up will be more difficult- we just took a cab up the hill every night, which is inexpensive and easy to find in Cruz Bay. If you rent a car, this of course won't be an issue. Also, the place is beautiful, but not air conditioned. Since my husband and I are acclimated to island weather having lived here for a while, this wasn't a problem for us. There is a ceiling fan and a box fan that cool the space nicely, and it cools down a lot at night, which is when we were mostly there anyway. In short: Brittany and Robert are lovely hosts, and you should stay here if you want a wonderful, private getaway on St. John. Brittany (and her puppy) picked us up from the ferry upon arrival and showed us around town, and she and Robert continued to be excellent hosts throughout our stay. The highlight was easily the view - you can watch the sun set over the water from the bed or the deck. Very private but noise travels easily. It's a single room with a king-sized bed, a mini-fridge, a microwave, a Keurig and some dishes. The bathroom is private, and view from the shower is almost the same as the one from the bed - gorgeous. Wifi is solid. Would absolutely come back here - just what we needed for an awesome getaway! Tzipora, thank you so much for the review of your stay in the Honeymoon Suite at Sunset Serenade! Robert and I were so happy to host you for your St. John vacation. 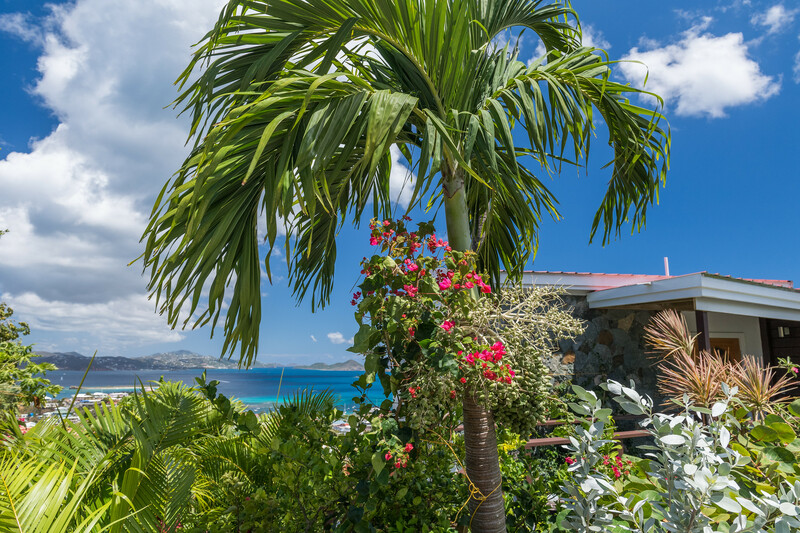 We absolutely love those gorgeous Caribbean views, too! We love hearing how much you enjoyed them, from all areas of the suite. Come visit us at Island Abodes again soon! We just returned from our stay in this property with our 1 year old. The view from this unit and the property in general were just stunning. You could see so far. The unit was very comfortable. There is a huge balcony which we enjoyed after the baby went to sleep. The owners were also very nice, and helpful throughout the stay. The only negative about the property is no air conditioning, but the owner mentioned even this would be added soon, and it really wasn't bad because of the ocean breaze you get up so high. Would return again. Many thanks for your review Nicole! We really enjoyed having you and your family stay with us and were pleased to hear that you enjoyed the lovely views, your accommodations, and the spacious balcony. You'll be happy to learn that we are installing Air Conditioning in the unit this week, so thank you for your suggestion and feedback! We do hope to welcome you and your family back so you can enjoy an even more comfortable stay with us. We'll see you soon! Wow! We did not want to leave! View- outstanding! Deck- perfect for morning coffee and sunset glass of wine! Bed was very comfortable. Shower was retro and very spacious. Was worried about not having AC but the breeze was all we needed plus the room had two floor fans and a ceiling fan. Brittany and Robert were very nice and helped us pre and during vacation on things to do, places to eat! We can't wait to return! Thanks you Island Abodes! Perfect girls getaway with breathtaking views! My best friend and I stayed at Brittany and Robert's beautiful home on St. John and we could not have been happier with the entire experience. The Sunset Serenade is a quiet paradise located high above Cruz Bay with breathtaking views and amazing sunsets. 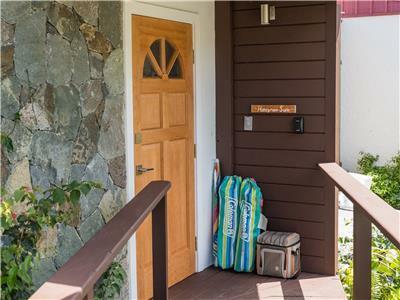 While you may feel far away from it all while you sip your coffee on the peaceful and private patio, the home is also very centrally located and it was very easy for us to get around and get into town (we did not rent a car). Brittany and Robert are truly wonderful people and were very accommodating, going above and beyond to make sure we enjoyed our stay on St. John. The bed was incredibly comfortable, the coffee was delicious and the views were spectacular. We would highly recommend this beautiful and comfortable spot for your next vacation! Hi again Molly! Thanks for taking the time to post a review on Vrbo! Robert and I loved hearing that your stay exceeded your expectations and that you enjoyed the gorgeous views, comfy bed and yummy coffee. We can't thank you enough for sharing your feedback and recommending us and we hope you will return to see us again in the future! What an absolutely lovely stay. We arrived in Cruz Bay and got picked up by Brittany who introduced us to St John. We than arrived at our beautiful apartment with an incredible view. Highly recommend staying here. Not a thing to complain about. Thank you for your great review Duncan! Based on your kind words and 5 stars, it sounds as though you thoroughly enjoyed your stay and all of the amenities that came with it! We were happy to assist you both before and during your visit in May and please consider staying with us again next time to return to St. John. We'd love to have you. my boyfriend and I absolutely loved our stay in the honeymoon suite at sunset serenade! my flight was delayed in to Saint Thomas and a group of us hired a private water taxi to get us to Saint John at 1 o'clock in the morning. By the time I arrived, Britney was there to pick me up at 2:30 a.m. at the ferry dock! The bed was king size and super comfortable with awesome soft sheets! The deck was spacious with chairs in the shade and lounges in the Sun. The view of Cruz Bay and over to St Thomas was beautiful! There were many beautiful touches such as 2 sets of beach towels, cooler and chairs for the beach, bug spray, the Keurig coffee and tea maker, a mini refrigerator, a toaster oven, bedside flashlights, a mosquito racket, a shower with a view.the walk down into Cruz Bay is definitely doable, but quite steep. It took me about 15 minutes to get into town on foot. With the heat of June I only did it once, and then we rented a car for 24 hours. This probably wasn't necessary, but I would not have wanted to hike up to the property with my 2 bottles of wine and bottle of water and food for lunch. However, hitching up the hill was quite easy. I would DEFINITELY stay here again! Robert's honeymoon suite was a very remarkable place to remember of throughout my 3 weeks tour around the region. The room itself is very detailed, with a lot of amenities making your stay comfortable, the view is spectacular from the private balcony. 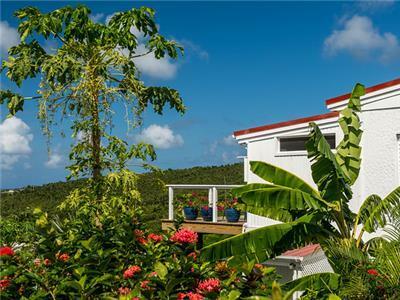 Walking distance downhill to Market Place and downtown Cruz Bay, but better hire a car ride when returning to the suite uphill. Overall I enjoyed the quietness and coziness of the suite, and Robert is a wonderful person he has been very helpful hosting me. Thanks Boris, we appreciate your review and I was very glad to hear that Robert made you feel so welcome! We really enjoyed having you and hope you'll stay with us again in the future. Thanks again! What a great find! Our suite had anything you could think of plus it was extra clean. Brittany and Robert were very accomadating for our early arrival. We happened to be there for Carnival that is celebrated over the July 4th weekend! The view for the fireworks could not have been better!!! My favorite part of the stay was sitting on the beautiiful private deck! Amazing views of the surrounding islands! Can't wait to stay here again in February! We appreciate your feedback Pat! Thank you for taking the time to post such a glowing review! Carnival is such a fun time on St. John and we were glad you were able to experience it and get that great view of the fireworks show! We look forward to seeing you again in February! Thanks again. Thank you for your review and kind words regarding the hospitality you received during your stay. It was great meeting you both and Robert and I truly enjoying having you! It was my pleasure to get you up and down the hill - we know the hills of St. John can be brutal! We were happy to hear you enjoyed the terrace, beautiful views, and your stay overall. Thanks again and we'll see you soon! My wife and I recently stayed in the honeymoon suite while two other couples we came with were staying next door in the penthouse suite. We could not of asked for better accomodations! The room was spotless and the view from the terrace was amazing. I could of stayed in the daybed the whole trip. Privacy was not an issue at all, even with our friends staying next door. Brittany was the best host and helped us with everything we needed. We will definitely be back! 5 stars! Thanks for posting a review Brian! It was nice to hear that you and your wife enjoyed the Honeymoon Suite, we appreciate your kind words. We do our best to ensure our guests are comfortable and happy, so it was no problem to assist you guys! We enjoyed having you and hope to welcome all of you back in the near future. Take care. The unit was wonderful. Cute and Caribbean in feel. There was not the resort feel to the place which I loved. The view was better than the photos. The location great. I've been coming to St John for 15 years. There is no place like it for spectacular beauty. Especially for those that like to hike, snorkel, sail, be outside. The owners were very accommodating. In short a wonderful vacation. Can't wait to return. Thank you Lewis! We truly appreciate you taking the time to post a review on VBRO regarding your recent stay with Island Abodes. We were glad to hear you found the Honeymoon Suite to be just what you were looking for, and that the view was better than the photos! As a seasoned vacationer on St. John, it means so much that you chose to stay with us and we hope to welcome you back again in the future. We truly enjoyed having you as a guest. Thanks again! We really enjoyed our stay in the Honeymoon Suite this past weekend. The room had everything we needed - a large bed, space to unpack our clothes, a whole kitchenette area with dishes, a spacious bathroom with nice shower, and of course the amazingly comfortable deck overlooking Cruz Bay! Some of our favorite moments during our time there was actually just having coffee and breakfast out on the deck watching the sunrise, or snuggling under a blanket under the stars. The host, Brittany, was very kind and helpful! She was around when we needed her, but all the other times gave us our space. We loved having a kitchenette so we could eat some meals on our deck - the kitchenette has a mini fridge, microwave, sink, toaster oven, and Keurig coffeemaker. We didn't even need the AC the whole time we were there because the large windows and balcony door provided enough of a breeze. And the landscaping around the house was just gorgeous! The only thing I would recommend would be renting a car for the duration of your stay. There are taxis around the island, but being up a little ways from Cruz Bay it is a lot easier to get around if you have your own car. Plus then you can throw the cooler and beach floaties in the back of your Jeep to take to Honeymoon Beach :) Island Abodes would be our first choice for a place to stay if we come back to St. John! Thanks for your review Mary! Both Robert and I really enjoyed having you two as guests and can't thank you enough for choosing Island Abodes. We absolutely loved reading just how much you guys enjoyed the Honeymoon Suite, all of its amenities, and that spacious deck with a view! It was my pleasure to help you with anything you needed and am just so glad to hear you enjoyed yourselves. Thank you for your rental car suggestion as well - as you mentioned, the island is far from flat and we always recommend all of our guests rent a car in order to see as much of the island as you can! We appreciate your review, recommendation, and plans to stay with us again. We look forward to having you! This is my first day back in New York and I find myself daydreaming of our home for the past week in St. John. Brittany made sure that you have all of the necessities for a great stay while on the island. The unit's kitchenette is fully stocked and there was a full supply of Keurig coffee for our entire stay. There are beach chairs, a cooler, noodles, koozies, cups and towels for a long day at the beach. The views overlooking Cruz Bay were gorgeous. My fiance and I found ourselves most nights coming back around 6pm and staying out on the terrace until dozing off. Brittany was very helpful prior to the trip with providing general information about St. John and what to do while we were there. We did not rent a car and she picked us up from the ferry and drove us the grocery store to make sure we were well stocked for the week. The unit is completely private, we could tell there were other people in the surrounding units only by the cars parked in the driveway. I am already looking at planning our next trip, it was a spectacular experience all around! Hi again Whitney! Thank you for posting a review on VRBO! Robert and I really enjoyed having you and your fiance and I was happy to help you guys get stocked for the week and to answer any questions you may have had. We were happy to hear you guys enjoyed the Honeymoon Suite and that you put all of the amenities to good use! I'm glad you were able to enjoy your stay and that it seems to have exceeded your expectations. Again, thank you for taking the time to post such a great review and stay warm in New York! We can't wait to welcome you back! My wife and I spent last week celebrating her birthday in St. John - it was our first time on the island. The island itself was everything we had hoped for and the room was awesome! Robert and Brittany were superb hosts. They responded to texts/emails within minutes anytime we had a question about the property or the island in general. They certainly achieved their goal of providing "affordable luxury". We will definitely return to St. John and we will stay at the Sunset Serenade when we do. Thank you for taking the time to share your feedback and post a review Jeff! We truly appreciate it and were happy to be your hosts for your first time on our beautiful little island. We're just glad you were able to enjoy it as much as we do! You and your wife were excellent guests and please tell her Happy Birthday from us once again! Thanks again for your review, we look forward to your return and the opportunity to once again provide you with affordable luxury. Just finished up our stay with Island Abodes in their Honeymoon Suite at Sunset Serenade in Cruz Bay, St. John USVI. This is the perfect condo to rent for a romantic getaway! My wife and I really enjoyed our time here. The honeymoon suite describes the unit perfectly! It is really romantic laying under the stars at night over looking Cruz Bay! My wife and fell asleep every night on the private balcony in the very comfortable day bed lounger. The bathroom area is very cool! The shower is open to the balcony which allows for amazing views of the bay! The place was extremely clean and includes everything you would need just like you were staying in a resort. The room also provides you with all you would need for you beach excursions such as a cooler, very large beach towels, beach chairs and noodles. The owner Brittany was very helpful! She picked us up from the ferry, drove us to pick up our rental car and gave of a tour of the Cruz Bay area. She also gave us great advice on what restaurants to eat as well as the best beaches to visit. 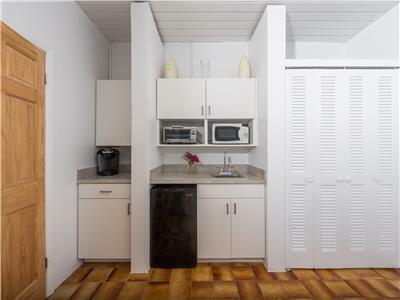 The unit is a studio kitchenette but no stove therefore you can't cook your own meals. Which was fine by us because we ate out every meal. However if you need a full kitchen Brittany has 3 other one bedroom condos that you can rent with full kitchens. 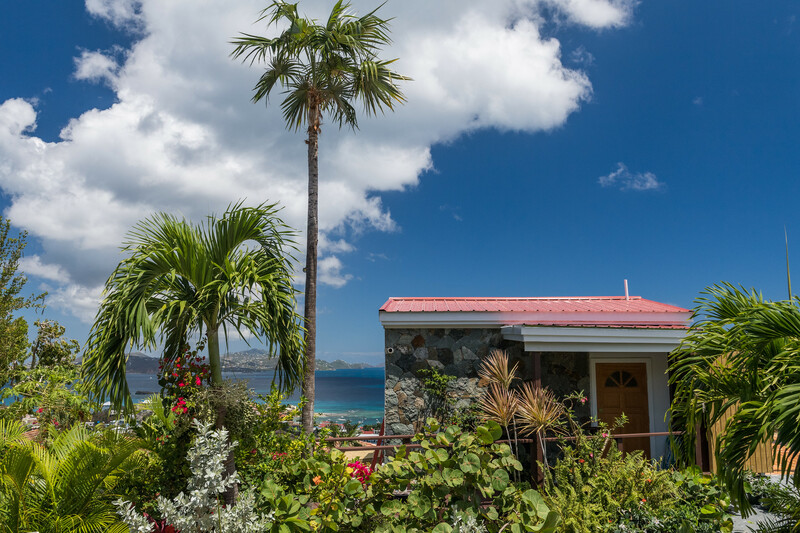 We had a fantastic stay in St. John and renting from Island Abodes was the perfect complement to such a beautiful place! Many thanks for your review John! Robert and I enjoyed having you guys and were so glad to hear you and your wife enjoyed yourselves so much. We really can't thank you enough for your kind words regarding your stay and for including the detailed information about our other Island Abodes properties. It really was great meeting you both and we'd love to welcome you back anytime! Thank you again and y'all take care! 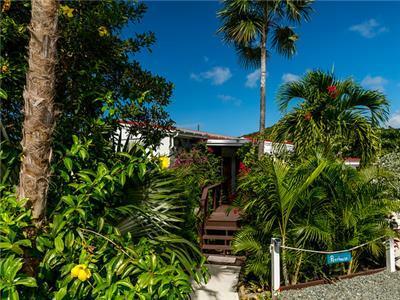 Very quaint quiet and relaxing space with the most amazing views of the gorgeous St John sunsets. It was a little rainy during my short stay in the Honeymoon Suite but the sunsets and views and beautiful flowers were just perfect. I loved the chair on the deck with the canopy and am now obsessed with finding one. Perfect for reading, relaxing and taking in the serenity rain or shine. Truly a great space and the owners are WONDERFUL. Thank you for your kind words and glowing review Angela! We hated that the weather didn't cooperate during your stay, but it sounds as though you enjoyed your time on St. John and we're just happy the Honeymoon Suite was a part of that! Thanks again and we hope to welcome you back. Your favorite chair will be waiting! Take care. I wish we'd of known about this place sooner. We booked an Airbnb place and it really did not work out at all. After toughing it out 2 nights, we found Island Abodes and booked the honeymoon suite. It was cozy, but chocked full of amenities and extras. Loved the stone floor shower; unique and set the mood for a great tropical vacation. The patio was awesome; we almost fell asleep outside watching the stars, but the mosquitos hit :( The circle, shaded couch on the patio was perfect for a romantic snuggle. We will definately be staying here again. And the hostess, Brittany, was great, as was Morgan, their little shy pitbull. Brittany was very welcoming and willing to help out in any way. She gave me a tour of the lower apartment as well, which also looked like it would have done splendidly for our stay. Great place for adults looking to get away from it all. Many thanks Melissa! Robert and I really appreciate you taking the time to post about your stay on VRBO, and it was great meeting you both! Although we're not pleased your other experience didn't go as planned, we're glad that it lead you to us! It sounds as though you enjoyed your stay at the Honeymoon Suite, and we're glad we could help you leave St. John feeling relaxed and refreshed. Thanks so much again and we, including Morgan, hope to see you again in the future! My boyfriend and I stayed three lovely nights at the honeymoon suite at Island abodes. We can't recommend it enough! Brittany was very accommodating and the villa was spectacular! The views were beautiful, the shower was great and it was located close to cruz bay. The bed was comfortable and they had a coffee machine and a mini fridge which was nice to have. We will absolutely be staying here again next time we come to St John!